I think this large jelly was of a different kind from the small ones that were ubiquitous. This one was at Meditation Wall. One Jelly. So far as I can tell, the arms weren't missing: they were just naturally short. 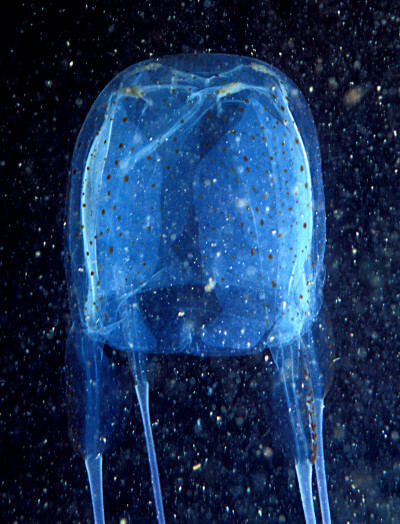 This is a close view of the "head" of a box jelly. They seem surprisingly agile and purposeful as they trail their tentacles through twisty passages. Their insides look like wrinkled sheets of wax paper or plastic. Quite a few of them have been showing up at Refugion Beach lately, in the shallows when the surf is low.